June… A month of heavy down pours, loud claps of thunders, sharp lightening… Yes. I am talking about Indian Monsoon rain. It is raining here in UK but I still miss the monsoon rain. For me they were always wild yet serene. I miss the heavenly smell of damp earth when the rain hits the ground for the first time, first drop of rain falling on my face, subtle scents of jasmine from garden, aroma of hot cup of coffee, the swaying of palm trees, pittar-patter of rain drops on roof, knee-deep water on roads, the falling of mangoes and coconut in backyard… Ah monsoon… There is magic in that word, there is romance in season and there is life in it. Magical beauty of monsoon cloud always reminds me the poems of Kalidasa’s Meghaduta. Meghaduta, the cloud-messenger is a collection of poems which narrates the story of a Yaksha (a divine attendant of Kubera, God of wealth according to Hindu mythology) who is exiled for a year from his home and his new bride. Yaksha during his exile passes his messages to his beloved through passing monsoon cloud and the poem beautifully covers the vivid journey of cloud passing through mountains, rivers, forests and the love, longing and passion these lovers share. No wonder monsoon is aptly called as lover’s season because monsoon brings with it a feeling of love, romance and longing. Majjige Huli is one such recipe which brings back fond memories of home. Lightly spiced coconut and buttermilk curry is my favourite dish to eat with aromatic basmati rice and spicy mango pickle. It is one of the dishes which bring out the true taste of vegetable as usually only one vegetable is used to make it. My favourite vegetables for cooking Majjige Huli are green bell pepper, Thai eggplant (Udupi Gulla Badane), green tomato, chayote, yellow cucumber and ash gourd. Majjige Huli is much similar to Mor Kulumbu of our neighboring state and can be prepared with minimum ingredients and very little time. Cook ash gourd in about 2½ cups of water with salt to taste and tamarind for about 5-7 minutes. Use tamarind only if the buttermilk/yogurt is not sour enough. Grind grated fresh/frozen coconut with green chillies, jeera and turmeric powder adding little water to make a smooth paste and keep aside. When ash gourd is cooked add this ground paste and mix well. Add little more water if the gravy is too thick and bring it to boil. In a mean while, beat yogurt by adding little water at a time to get buttermilk consistency and add it to the curry and mix well. Cook it for further 1-2 minutes in low flame and turn of the gas. Heat coconut oil in a tadka pan and add mustard, hing, broken red chilli and curry leaves. When mustard starts to pop and sputter transfer the tadka to Majjige Huli and mix well. Serve hot Majjige Huli with rice and pickle of your choice. I have never seen anybody complaining abt monsoon in India. It was never too much there. I closed my eyes and was able to see what you saw.. Such a vivid description.. Oh I miss India :(..
Majjige Huli looks great in that 'mango' dish :) I was surprised to see tamarind with sour buttermilk. For those tangier mouths I reckon. oh, and the majjige huli looks great, love that bowl... Only way I like ashgourd is in moru curry. I too make this curry, your picture is so beautiful. that dish is very pretty. Have a great vacation.We are leaving on Saturday as well,will be back in a week.Check out Wednesday at FH if you can,something special(Hint:I am in TOI! ),will post it there. Majjige huli is my favorite.Whenever I get Kumbalkai,I always make this.Looks delicious but cannot make it now.Trying to empty the fridge.Will make it your style when I come back. I am lovin' that CHILI bowl the most right now..where did you get that? Have fun on your vacation...come back with pictures! hey sia, happy vacation and have a wonderful time. Will miss u and we call it majjiga pulusu, a great soul satisfying dish! That's an interesting recipe ... that too with ash gourd. Thanks for the primer on one of Kalidasa's epic works. Have a relaxing vacation and get back with loaddddds of photos to share with us. Sia, Majjige Huli looks tasty. I cook a similar dish but I use Yogurt and no turmeric powder. I can imagine the taste. Have fun! Fun in the Sun? Love the platterBhari chenda iddu a bowl.very cute.Yavagalu you tell me same pinch.Well even i had prepared this but only difference is i added tindora .Love ashgourd.Enjoy gal. ~sigh~ I miss rains too.. I have been thinkng and dreaming abt it for the last 3-4 days!!! I miss the rains!!!!! 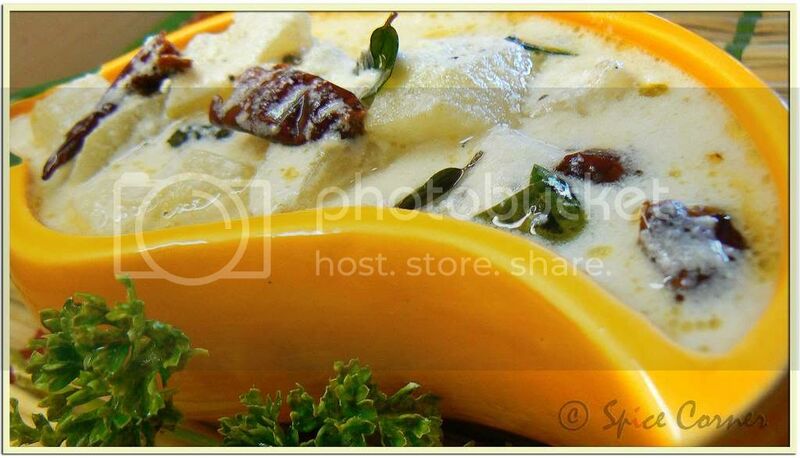 Ash Gourd majjige hulli looks so yum!! and wonderful snap as usual!! Sups enjoyed reading the post and everything about the monsoon :)I like all curd based curries from South India. Have a great vacation Sia... and thanks for this. I am always looking for different ways to cook Ash gourd. That I don't get it here is a different story... must go hunting!! I love ash gourd. Happy retreat! Come back soon! scene: sakkath hasdhirbeku....aaga, majjige huli with bisi bele bhath or huli thovve combination + big pieces of boodhgumbalkai holu, thuppa (i love a topping of kene too)! brahmaanda! r u serious? u must visit india in monsoons to enjoy all those pakodas and garam chai:) on serious note, i always loved indian rain and i miss it a lot. i like majjige huli to be more tangier and i have mentioned it my post to use tamarind only if the buttermilk/yogurt is not sour enough. as i dont get very sour yogurt i tend to use tamarind. i remember u saying u will be visiting king's place/palace:) have fun...even we r going for a week n dont think i will get chance to browse:( dont tell me u r leaving for a holiday and there u gonna sit and blog!!!! u r too much ashakka:) will come bk n check FH. oh yes!!! i always loved to get drenched in rain although i would get bad cold next day:) eating corn butta right from the coal with all that spice and lime was my fav thing in rainly season:) i too miss those days! he he...same pinch puna:) engoge kumbalakai 1st time sikkiddu. suluda tenginakai size inge tumba pay madiddeya but cant compromise on such things;) can we? join the gang girl:) we all miss the monsoon:) all those yummy pakodas, garam coffee, conrn cob on coal...so many things! thank you my dear:) hope u do try it some day. thats a nice post ..picture looks quite pretty as well..have a great hoilday..i think sig is right u guys going for a romantic holiday..! !enjoy ..!! My store is "Hi-tech" you see, hehehe....we have wireless there too! Happy Vacation...even i planned for 1 week stay at my sister place which is 4hours from my place...willbe back on July1st only. lovely pics & recipe :) have tasted majjige hulli sometime back, good to know it can be made with so many veg. Hi Sia, lovely recipe and good presentation. I like your serving bowl. Its very cute. Thanks for sharing such a wonderful recipe. hey my kitchen partner:) majjige huli is tasty if u use any one of the veggies i mentioned. raw green tomatoes and capsicum were my fav ones. I never quite saw monsoon that way but now, I may be able to see it in a better light! :) Majjige huli looks so good, Sup! I usually add soaked chana dal in the ground masala. Have a good time away from the hustle bustle of daily life! I love the crockery and the dish you made. I also enjoyed very much reading about the monsoon rains and the bit about hindu mythology. Enjoy your break. Will miss you and am looking forward to your return. 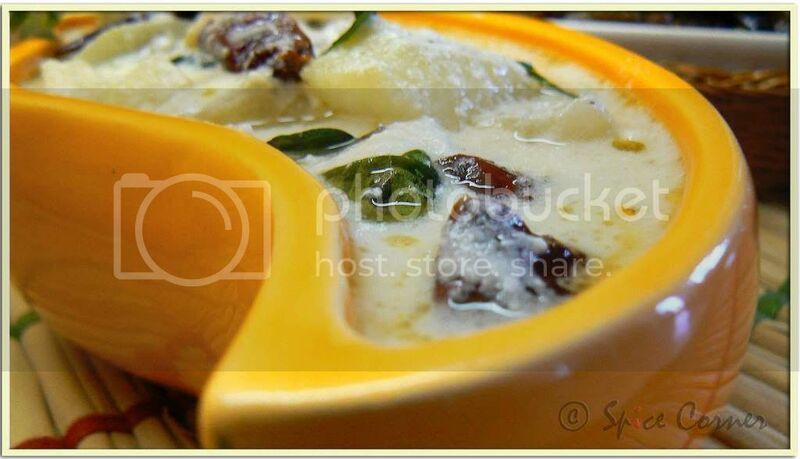 Wow what a lovely dish in a wonderful bowl... needless to say abt the photography and the presentation. Take care and have a great trip. Hey Sia.. Wonderful dish. Oh the monsoon rains. I miss them too. You guys have a fun vacation. hi Sia, hey dieing to this one.. i lov melara... its been ages i didnt eat melara.. different recipe. i dont use jeera and turmeric powder for melara.. try madte this one..thnx for the recipe..
Hi Sia, Your write is wonderful and its raining in India. Your write up made me nostalgic....I miss India. Btw Majjige huli looks very tempting.I enjoy it with spicy yoghurt chillies and now my mouth is watering.........Have a gr8 vacation! These pics look like a treat.And enjoy ur vacation. hi just a small tip........ take 2 pinchs of urad dal & 1 small pinch of menthi seeds dry roast it for a sec &add it to the masala being ground.While the masala is done again dry roast 2 spoons of white rice & add it to the masala run again for 2 mins &add it to the cooked ash gourd! makes the hulli more tastier ,fragrant& the rice makes it a lill' thicker! Sia, you have been tagged! OMG, that mango-shaped bowl is just too cuuuuute!!! :) sorry i have been mia, girl! how have you been? We too prepare the same dish in Andhra called 'Majjiga pulusu', served with rice and plain dal. It's little different than your version. Also never tried with the first three vegetables you mentioned though we prepare it with others and even with chayote and green cabbage. tel us, tell us. where did you go? what did you eat? what crazy things did you do? thanks girl for tagging me:) i will come n check it soon:) bit held up with loads of office work. Welcome back Sia. Missed you. Did you get some sun :)? Looking forward to hearing about the trip. such a beautiful post about the monsoon rains! I too love the rains. Here in Florida we get the hurricane rains and I love cuddling on the couch with my kids watching the bamboo trees whip about. Lovely write up about the monsoon, and the Kalidasa poem. What does an Ash gourd look like? 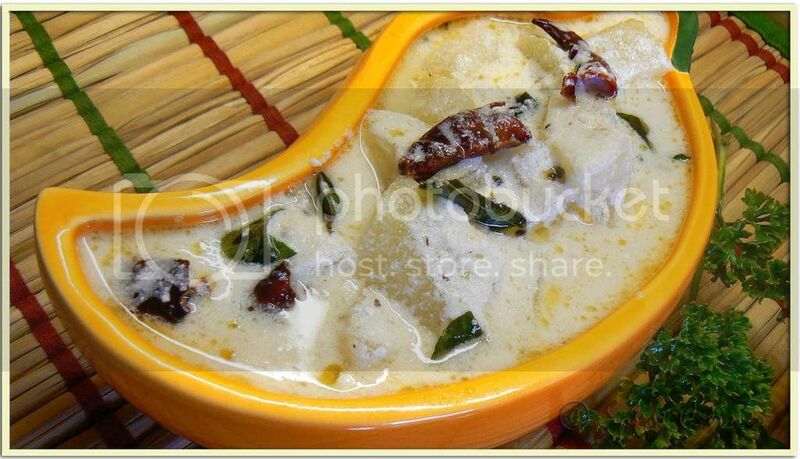 I love mor kuzhambu with the watery type vegetables, and this looks delicious. ash gourd is also known as winter melon here. it looks like green coloured gourd covered with ash. here is the picture of it. its also known as boodagumbala in kannada, kumbalanga in malayalam and booDida Gummadikaaya in telugu. Your description of monsoon bloomed fond memories of my favorite season in my mind. I really miss the first shower that hits the earth and the smell and greenery that it brings along with a lot of other pleasant changes. Excellent recipe too!! Excellent pictures. Tasty dish. Tempting :) Thanks for the post. A Century & Not Out!! !